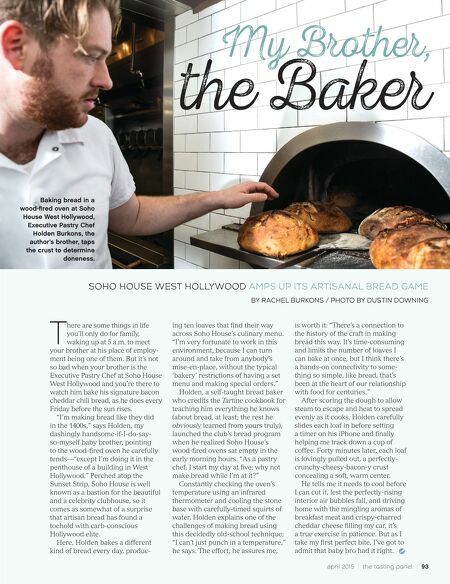 april 2015 / the tasting panel / 93 SOHO HOUSE WEST HOLLYWOOD AMPS UP ITS ARTISANAL BREAD GAME by Rachel Burkons / photo by Dustin Downing My Broer, e Baker Baking bread in a wood-fired oven at Soho House West Hollywood, Executive Pastry Chef Holden Burkons, the author's brother, taps the crust to determine doneness. T here are some things in life you'll only do for family, waking up at 5 a.m. to meet your brother at his place of employ- ment being one of them. But it's not so bad when your brother is the Executive Pastry Chef at Soho House West Hollywood and you're there to watch him bake his signature bacon cheddar chili bread, as he does every Friday before the sun rises. "I'm making bread like they did in the 1400s," says Holden, my dashingly handsome-if-I-do-say- so-myself baby brother, pointing to the wood-fired oven he carefully tends—"except I'm doing it in the penthouse of a building in West Hollywood." Perched atop the Sunset Strip, Soho House is well known as a bastion for the beautiful and a celebrity clubhouse, so it comes as somewhat of a surprise that artisan bread has found a toehold with carb-conscious Hollywood elite. Here, Holden bakes a different kind of bread every day, produc- ing ten loaves that find their way across Soho House's culinary menu. 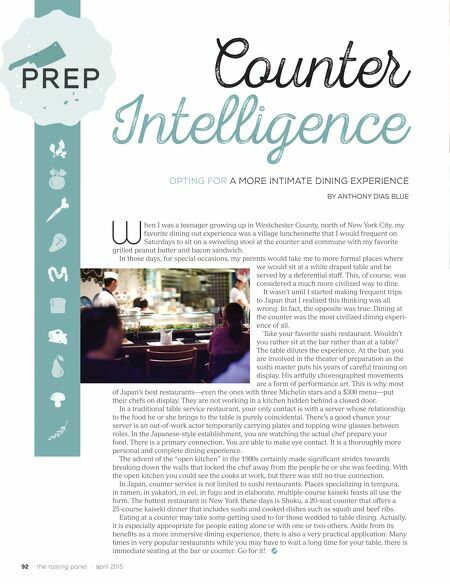 "I'm very fortunate to work in this environment, because I can turn around and take from anybody's mise-en-place, without the typical 'bakery' restrictions of having a set menu and making special orders." Holden, a self-taught bread baker who credits the Tartine cookbook for teaching him everything he knows (about bread, at least; the rest he obviously learned from yours truly), launched the club's bread program when he realized Soho House's wood-fired ovens sat empty in the early morning hours. "As a pastry chef, I start my day at five; why not make bread while I'm at it?" Constantly checking the oven's temperature using an infrared thermometer and cooling the stone base with carefully-timed squirts of water, Holden explains one of the challenges of making bread using this decidedly old-school technique: "I can't just punch in a temperature," he says. The effort, he assures me, is worth it: "There's a connection to the history of the craft in making bread this way. It's time-consuming and limits the number of loaves I can bake at once, but I think there's a hands-on connectivity to some- thing so simple, like bread, that's been at the heart of our relationship with food for centuries." After scoring the dough to allow steam to escape and heat to spread evenly as it cooks, Holden carefully slides each loaf in before setting a timer on his iPhone and finally helping me track down a cup of coffee. Forty minutes later, each loaf is lovingly pulled out, a perfectly- crunchy-cheesy-bacon-y crust concealing a soft, warm center. He tells me it needs to cool before I can cut it, lest the perfectly-rising interior air bubbles fall, and driving home with the mingling aromas of breakfast meat and crispy-charred cheddar cheese filling my car, it's a true exercise in patience. But as I take my first perfect bite, I've got to admit that baby bro had it right.